Like Warner Valley to the southeast, the Butte Lake region in the northeast of Lassen Volcanic National Park contains some of the best volcanic features in the area, but is visited by comparatively few people, since both locations are reached only by unpaved roads, starting some distance away from the main route through the park (Hwy 89), and both need a certain amount of hiking to view the geological features. Within 2 miles of the Butte Lake trailhead are four fascinating sites - the lake itself, a deep blue expanse bordered by black lava blocks, the Fantastic Lava Beds, Cinder Cone and the Painted Dunes, this latter being undulating, red and black hills of volcanic ash. 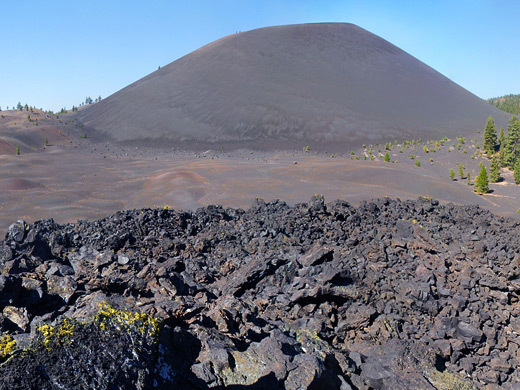 The highlight is probably Cinder Cone, a symmetric, almost completely unvegetated peak of grey-black cinders, with a crater in the middle, the top of which affords great views over the entire park and beyond. Besides these nearby attractions, several longer paths lead to many places in the eastern park backcountry, and in the Caribou Wilderness further east. Butte Lake also has a good (maintained) NPS campground and is close to free camping places in the Lassen National Forest a few miles north. 16 views of Butte Lake, Cinder Cone, Fantastic Lava Beds and the Painted Dunes. Cinder Cone, Fantastic Lava Beds. The Butte Lake access road forks south off Hwy 44, 24 miles from the northern national park entrance on Hwy 89, and leads through flat pine forest for 6.5 miles, past one national forest campground and into the park. The last section is more bendy, before the road arrives at the NPS campground, ranger station & self-pay fee station, and ends at a parking area on the north shore of the lake, from where various trails begin. 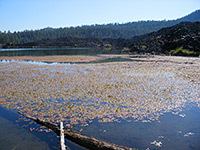 The north and east edges of Butte Lake are lined by regular pine woods, but the other sides are formed of a huge pile of black lava blocks - part of the Fantastic Lava Beds that extend several miles south. A disused track leads a little way along the shore to the edge of the lava, as it plunges steeply down into the clear, deep water, creating quite an unusual scene. This corner of the lake is partly covered by colorful lily-like plants, adding to the photogenicity. At the trailhead, one path climbs a hill a short distance to the two Bathtub Lakes, and another, much longer route curves around the east shore of Butte Lake towards Widow and Jakey lakes, but the most used trail, to Cinder Cone and beyond, sets off southwest, through mature forest of tall, well separated fir and pine trees on a floor of dark grey ash, largely without undergrowth. After few minutes walk, the trail is running alongside the Fantastic Lava Beds, where jagged, jumbled lava blocks rise up to 100 feet, also totally lacking any vegetation apart from the occasional patch of lichen. There are no paths across the lava, and although climbing up is quite possible, the boulders are sharp and unstable, and hide deep fissures. The view from the top is good though (see panorama). As it follows the edge of the lava, the Cinder Cone Trail starts to climb gradually and reaches the junction with a 3 mile path to Prospect Peak, another extinct volcano - a fairly strenuous hike that gains over 2,000 feet. After here, the cone becomes visible ahead, through gaps in the trees, and the route soon arrives at a second junction; right is the continuation path to the park backcountry while left is the route to the summit. The summit path climbs 640 feet over a distance of just 1,700 feet, up the north side of the conical butte, and is quite tiring, especially the lower section where the ground is loose, coarse ash. The surface over the upper half is small stones so hiking is a little easier though the gradient is just as steep. Coming down is very quick, however - just a couple of minutes if running, compared with 15 to 30 minutes going up. On the top, the path loops all around the outer rim, another goes around the inner rim, slightly lower down, and a spur descends quite steeply to the crater floor (see panorama). 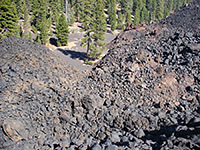 Like the outer slopes, all the inside of the cone is made of the same red-black cinders (officially scoria, pieces of ejected lava that solidify before reaching the ground), and the only things visible apart from stones and sky are a few trees growing along the rim. Views extend all across the park to Lassen Peak and Brokeoff Mountain, and to other, more distant summits. 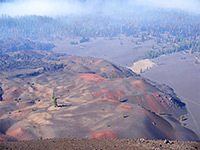 South and east of the Cinder Cone are the Painted Dunes, also composed of red black ash, and covering several square miles, again with just a few trees to interrupt the pure volcanic landscape. The course of the eruption is evident from above by the flow lines of the lava, curving away south towards Snag Lake and north to Butte Lake. The volcanic activity hereabouts has been dated to a two-stage eruption in the 1650s.